Since the inception of J.D. 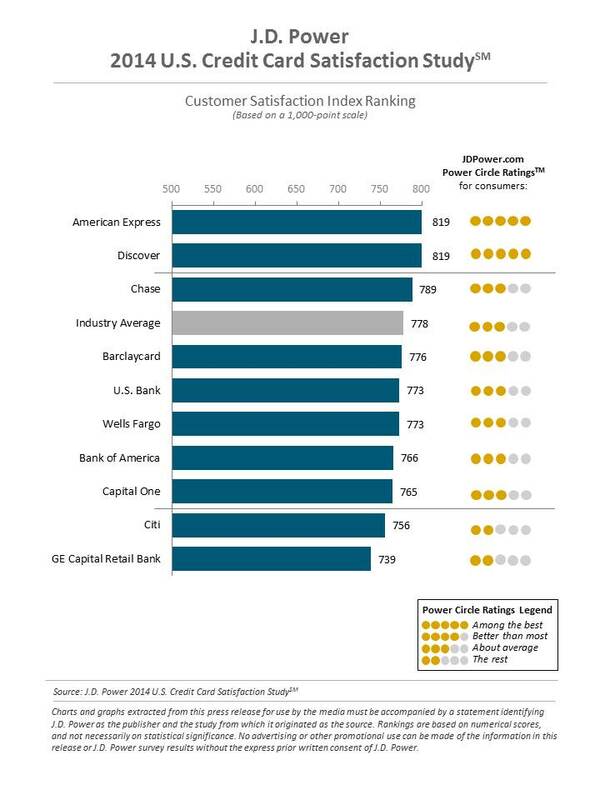 Power’s U.S. Credit Card Satisfaction Study in 2007, American Express has held the highest ranking among credit card issuers by itself every year. But this year, Discover joins them at the top, as the two firms tied for highest overall customer satisfaction in the latest rankings. As part of the study, J.D. Power surveyed nearly 20,000 credit card customers between September 2013 to May 2014, examining six factors: 1) interaction, 2) credit card terms, 3) billing and payment, 4) rewards, 5) benefits and services and 6) problem resolution. Overall, they found that consumers were more happy than ever with credit card issuers in 2014. Across all issuers surveyed, customer satisfaction was rated at a record-high 778 out of 1,000, compared to the previous high of 767 set in 2013. American Express and Discover tied for the highest overall scores with 819, despite achieving those scores through very different means. While Discover essentially focuses on a single cash back rewards card with no annual fees, American Express offers a wide range of cards, from charge cards to cash back credit cards to travel rewards cards with and without annual fees. Ultimately, however, when breaking down the results, the common factors that differentiated the two firms from their competitors were in the areas of terms, benefits and services, billing and payment, customer interaction and problem resolution.